This is the team of N a Sonje, the two organizations, the fellows of MJRAV in the green t-shirts and the women’s organization, AFSAKA, in the yellow t-shirts and me behind in a pink t-shirt! We were honored to have Fonkoze folks come and visit our center and learn more about our work. Fonkoze is our fiscal agent for donations! Thankful for their time to come all the way up here to meet and listen to the team make a short presentation! Keystone College president, Dr. David Coppola in July this year after he had been academically accepted a few months prior. Each year only one international student is chosen by the president for a 4 year full scholarship to Keystone. But not only is Yaya the recipient of this prestigious award but he is also hugely blessed with total food, housing and family care by Arts and Graphic Design professor at Keystone, David Porter and his wife Donna as well as their church community there in northeastern Pennsylvania. Dave has been coming to Haiti for over 8 years and has continually been an encourager of the development of Yaya and all the others in our organization over these years and has been a tremendous advocate for these young men and especially Yaya! You can understand the beautiful smile as with the stress of interviewing at the US embassy in Port-au-Prince over with and the reality now in his hands, this coveted asset is a link to the whole world through his studies, majoring in the Science of Education that will benefit his country, his community and his family in the years to come! It can’t help to be a bittersweet accomplishment as we all will feel his absence very dearly. He has been an exemplary member of our organization as well as the general coordinator of our team, INAM (means: Union N a Sonje, AFSAKA (the women’s organization) and MJRAV (the men’s organization) as well as the president of a local cultural organization that he has been a member of for many years. We will miss him profoundly but with great expectations filling the gap in our hearts! Our sincerest gratitude to Dave and Donna Porter for their personal investment of love and support to this young man who will be an intimate part of their family for the next 4 years! May angels dance in delight at this feat of love! Yaya will always need your support in many ways, his adapting to the US, the weather (he’ll be arriving in the dead of winter), the culture, the time constraints school will press on him thus stress that is a different stress than in Haiti for sure! Keep him in your thoughts and let us know if you want to participate in his American adventure through this precious educational opportunity in any way you may consider. Thank you for following these exceptional young people in their journey towards fulfilling their destiny! N a Sonje!!! Prior to arriving to Ayiti (Haiti), we prepared ourselves for the trip by learning some history, basic Creole words/phrases, and a little bit about Ayisyen Culture. Although we felt that we had prepared fairly extensively, being at Na Sonje we were able to gain a much deeper understanding of all of these topics. Na Sonje facilitated our learning through small group conversations, artistic expression, food, homestays, personal story sharing, culture and language lessons, and hands on immersive experiences. While at Na Sonje we learned a song that embodied the importance of sharing with one another and being able to learn and grow with one another through interpersonal experiences- such as telling our stories or being invited into another person’s home. By listening to one another’s stories we were able to find similarities, and realized that we are more similar than different. By allowing ourselves to step outside of our comfort zones we were able to be more vulnerable and have a more genuine connection with each other. Everyone has a story to tell, and by opening ourselves up to strangers (who we can now call friends) we realized how we can benefit from learning the stories of others around us at home as well. Na Sonje and the surrounding community impacted us all a great deal and although this wasn’t a traditional service trip, we were able to see the impact of our time spent on the community at Na Sonje. As we were entering an unfamiliar community it was important for us to hear, and for them to tell, the history and the current story of Ayiti from Ayisyen’s themselves. When working with Na Sonje were to able support various local artisans when we made coffee, casava bread, and peanut butter. We also visited a local bakery, gift shop, and a woman’s home who made us corn pudding. In all of these experiences we not only learned a great deal about the work that goes into producing all of these things within the community, but we were also able to support the community financially through our participation. "3 Innocents and a spirit" and "2 Roots"
Check out our live Indiegogo campaign! While on a trip for “PDL” translating for visitors, a young woman came up to me and asked me if I was “Manman Laura, Leah ak Lisa?” I was a bit flabbergasted to say the least, totally unexpected but then I really shouldn’t have been, it’s not a very big country and 3 little blonde girls growing up in a rural isolated mountain village would be an outstanding memory for anyone growing up there. Here was Guerda, a young woman working as a health monitor for PDL who had gone to the catholic school that was located just below our house in Bwadlorens when we were working with MCC in 1988-1990. Our yard had a tire swing and 3 little white blonde girlies that liked to jump rope and swing on the tire at recess so some of the children from the catholic school would come up and play as I arranged to have our recess from our little home school at the same time as the catholic school bell rang conveniently! Another surprise is that she had promised herself that if she had a girl, she would name it after one of our daughters and thus there is now a Haitian Lisa! I attended a meeting this morning with members of 5 different microcredit groups being served by N a Sonje’s program. One of the groups called themselves “Ansanm Nou Fò,” which means “together we are strong.” N a Sonje practices group lending where each group is collectively responsible for the loans of its members and members go through the loan process together. Lerece, who has 8 years of experience in micro-credit in Haiti, runs the program and provides training and management. The ultimate goal though, is to pass the responsibility for managing the program onto the women themselves. The women welcomed me and answered some of my questions about what these loans can do for them. N a Sonje makes credit much more accessible to them because it is based in their neighborhood. To get a loan from another organization they would have to go into the city every month to deposit their payments in their accounts. Many other organizations also have a higher requirement for a savings account as collateral on the loan, and many also ask for them to have a cosigner for the loan. In addition to all these logistical benefits, N a Sonje also charges less than half the normal interest rate and doesn’t charge any fees. In my meeting with Lerece the other day he explained to me that he makes every effort to charge women as little as possible; for example, if a woman can pay her loan off ahead of time, she doesn’t have to pay the interest on the rest of the time period for her loan. He is able to be flexible with these issues to make the loans better fit the women’s needs and abilities. It was also very encouraging to hear the women talk about how useful this credit program is to them. It is difficult for them to find another source of credit to fund their businesses, and other sources would always charge more interest. The main complaint the women had is that the fund isn’t big enough to fulfill the demand. They would like to be able to take out larger loans, and there are plenty of people who are left out now simply because there isn’t enough money to go around. The program isn’t perfect though; there are always people who run into difficulties repaying their loan, and this is an issue they are facing now. Because they are working with a set fund, any default will decrease the amount of money available to loan. The women are aware of this issue and are working with Lerece to find a solution. There are other problems the women face as merchants as well. They don’t have the means to buy a spot in the marketplace; so many of them sell on the street in Petion-Ville. The police have started cracking down on this practice and it has become common for them to throw merchandise on the street or put it in their car and drive away with it. When I asked the women what they do to avoid losing their merchandise, one of them replied that she grabs her stuff and runs away. Madame Antoine sells spices and food to help her pay for school for her kids. She laughed when I asked if her business could pay for the school fees and said “No, but we add it to the other money we have.” Every little bit helps. Diline I knew already as a member of AFSAKA and a student in the Higher Education program. She sells clothes that are imported from Panama along with sandals for kids. She is able to make a decent profit on the clothes she sells and she uses it to take care of her daughter, Rosedarline. Nernite buys coconut, salt, and other things to make food and carries them up to Gwo Jan to sell them to a local boutique store. The money she makes helps her to pay for food and school fees for her kids. After learning of the community’s collective desire for street lights when a mayoral candidate recently installed new electric poles and lines in our community of Gwo Jan, our team INAM purchased 3 heavy duty street lights using our community fund garnered from profits made when we host groups at our center. It was with much satisfaction INAM proudly gifted Gwo Jan with these lights that now provide needed security along with the added benefit of creating a much appreciated social space in the evenings. INAM’s name stamped on the lights also promotes a positive “light” for our organizations as well. N a Sonje is excited to welcome its third intern to Haiti, Courtney Chatterson for the month of July! Courtney is a former Apprentice in Shared Living. 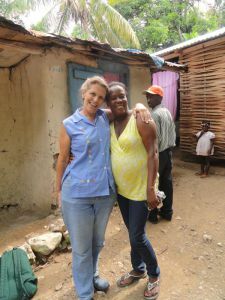 Through this program with Beyond Borders she spent a year living in Haiti, 8 months of which was spent with a Haitian family outside the city of Leogane. During this time she learned Kreyòl and as much as she could of Haitian customs and culture. She is happy to be back in the country after more than two years away! Courtney has just finished her first year studying International Development at the Graduate Institute in Geneva, Switzerland. She has one year left to complete her studies and is planning to write her thesis on the empowerment of women through microfinance in Haiti. While she is here, she will be helping N a Sonje to improve the website, fundraise for the scholarship program, and collect pictures, video and stories for the microcredit program.